“In my view, the biggest investment risk is not the volatility of prices, but whether you will suffer a permanent loss of capital. Not only is the mere drop in stock prices not risk, but it is an opportunity. Where else do you look for cheap stocks?" The NAV given is for the main share series for the relevant master fund. Investor’s holdings may be in a different share class or series or currency and have a different NAV. See the factsheets and/or your statement for full details. The index was adjusted since 1st June 2017. Prior to that it reflects 100% of the MSCI Frontier Markets Asia Net Total Return USD Index, and after 1st June 2017 it is 37% of that index and 63% of the Karachi Stock Exchange 100 index in USD. NAV and performance figures are all net of fees. The team at Asia Frontier Capital would like to wish all of our readers a wonderful and prosperous 2019! In contrast to most of 2018, this month’s market weakness was led by the U.S., which saw a massive correction with the Dow Jones Index at one point being down −15% for the month. However, frontier markets in general and each of our three AFC funds (AFC Asia Frontier Fund, AFC Iraq Fund and AFC Vietnam Fund) fared comparatively better. This month’s market movements were a clear example of the low correlations between developed markets and Asian frontier markets as some countries within our universe like Bangladesh, Cambodia, Iraq and Mongolia had positive returns for the month. We expect 2019 to be more stable for our universe as valuations have become very attractive and Asian frontier markets are expected to have some of the highest economic growth rates over the next five years in addition to having very favourable demographics. You can read more about the 2019 outlook in our latest “2018 Review and Outlook for 2019”. 2018 was a difficult year for the markets in general and emerging and frontier markets were also impacted. The major markets in our investment universe lost ground in 2018 and only our AFC Iraq Fund ended the year with a gain (+3.6%), while the AFC Asia Frontier Fund (−20.1%) and AFC Vietnam Fund (−4.2%) closed the year down. However, each of our funds outperformed the relevant index, showing our stock picking capabilities are intact. 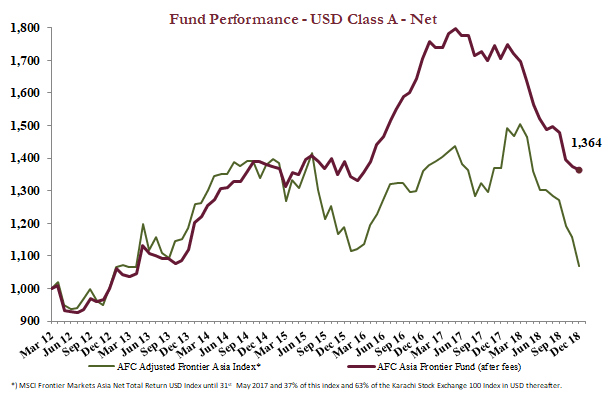 The AFC Asia Frontier Fund outperformed the AFC Frontier Asia Adjusted Index by +1.8%, the AFC Iraq Fund outperformed the RSIUSD index by +18.6%, and the AFC Vietnam Fund outperformed the Ho Chi Minh City VN Index (in USD) by +7.3% all just during 2018. We celebrated the 5-year anniversary of the AFC Vietnam Fund on 23rd Dec 2018. The fund has had an impressive overall track record with an annualized return of 12.1% and a Sharpe ratio of 1.31, while outperforming the Ho Chi Minh City VN Index (in USD) by +18.6%. The year 2018 was difficult for Vietnam and for our AFC Vietnam Fund as well, but the long-term average target return was achieved, while the investment case remains very compelling. During 2018 our team in Hong Kong has been strengthened, with Pansy Wong joining in a newly created role as middle office manager, while our office manager Margaret Kwok left us in order to emigrate to Canada. In her place, Christine Kwan joined as accounting and administration manager. We are confident that in 2019 the frontier markets in Asia will fare much better and that with our expertise in stock selection in frontier markets we will be able to continue to outperform for the benefit of our investors in the years to come. This month you will not find a travel report at the end of the newsletter. We are sending the travel report out separately in order to have a shorter newsletter. You may expect to receive the travel report in the future on the 20th of each month. The AFC Asia Frontier Fund (AAFF) USD A-shares declined −0.7% in December 2018. The fund outperformed the AFC Frontier Asia Adjusted Index (−7.7%), the MSCI Frontier Markets Asia Net Total Return USD Index (−2.9%), the MSCI Frontier Markets Net Total Return USD Index (−4.0%) and the MSCI World Net Total Return USD Index (−7.6%). The performance of the AFC Asia Frontier Fund A-shares since inception on 31st March 2012 now stands at +36.4% versus the AFC Frontier Asia Adjusted Index, which is up +7.0% during the same time period. The fund’s annualized performance since inception is +4.7% p.a., while its 2018 performance stands at −20.1%. The broad diversification of the fund’s portfolio has resulted in lower risk with an annualised volatility of 9.24%, a Sharpe ratio of 0.45 and a correlation of the fund versus the MSCI World Net Total Return USD Index of 0.36, all based on monthly observations since inception. Bangladesh conducted national parliamentary elections on 30th December and, as expected, the Sheikh Hasina-led Awami League and its coalition partners posted a convincing victory, winning 288 seats out of a total of 300. We believe this is very positive as the continuity of the same government will help execute economic policies in a more stable manner. More importantly, the uncertainty and the overhang on equity markets that was persistent through most of 2018 should now abate since elections are out of the way. 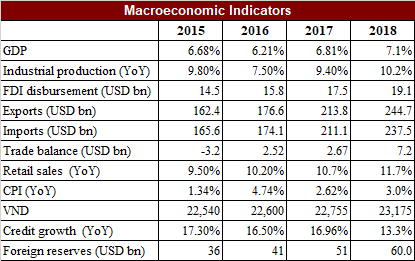 The market can now focus on the long-term fundamentals of the economy, which are extremely attractive with an expected annual GDP growth of 7% over the next five years. We are very positive on the consumer discretionary, financial services and pharmaceutical sectors due to Bangladesh’s large young population with increasing disposable income. In Vietnam, the stock market continues to be impacted by global sentiment towards equities even though the country displays strong economic growth, with 4Q18 GDP growth of 7.3%. 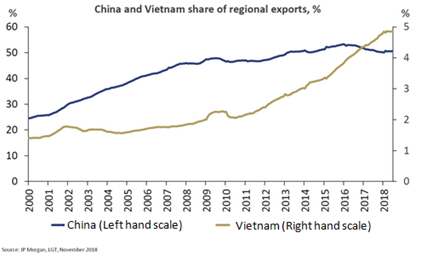 This is led by consistent manufacturing sector growth as Vietnam benefits from a transformation into a low-cost manufacturing hub and is expected to be a net beneficiary of the China – U.S. trade war. Macro uncertainty continued in Pakistan as the government is still negotiating with the IMF for a loan program. However, foreign exchange support of USD 3 bln from the UAE this month should reduce some short-term pressure on foreign exchange reserves. In our view an IMF program would give investors more confidence in long term policy making than stop gap arrangements with the UAE and Saudi Arabia. Sri Lankan Prime Minister Ranil Wickremesinghe was reinstated to his post by President Maithripala Sirisena which ended almost two months of political uncertainty. However, as the Prime Minister and President do not appear to be on the same page with respect to certain policies, there may not be any major pick up in political momentum. On a bottom up basis, the top three private sector banks have attractive valuations as the recent increase in non-performing loans appears to be priced in while these banks are still well capitalised with healthy RoEs. During the month of December, Mongolia experienced continued fallout from the SME Fund Scandal, where it was reported that a material amount of the fund’s USD 255 mln loan book was allocated to companies related to members of parliament, their business associates, and families. The findings led to a faction of the ruling Mongolian People’s Party (MPP) to call a no confidence vote of the Prime Minister (which he survived), and the arrest of four managers of the fund. Perhaps the best example of the public’s outrage at continued corruption among government officials as well as at the SME Fund Scandal was a protest held in Ulaanbaatar on 27th December where an estimated 25,000 people came out to protest in minus 20-degree Celsius weather. On a brighter note, on 31st December, Oyu Tolgoi LLC – the joint venture between the government of Mongolia and Turquoise Hill Resources (majority owned by Rio Tinto) - signed an agreement to build a 300-megawatt power plant at the Tavan Tolgoi coal mine. This is a milestone in the development of the Oyu Tolgoi copper/gold mine as last February the government cancelled a power agreement which now requires Oyu Tolgoi to source all of its approximately USD 150 mln to USD 200 mln in annual electricity consumption domestically within four years. It is estimated the four-year target will be missed, but the new powerplant is expected to begin operations by mid-2023. Uzbekistan saw its first ever secondary offering in the shares of a majority government-owned steel fabrication company during the month. The government sold down 10% of its stake through a brokered placement which was 126% oversubscribed, likely because it was sold at a bargain price with an approximate trailing twelve-month P/E of 3.44x and P/B of 0.46x. The company’s shares subsequently closed up 45% in the first day shares became free trading. This should provide a template for future government stakes being sold off to non-strategic investors as the government is in the early stages of a significant privatization of the economy which is presenting the opportunity for portfolio and strategic investors to fill the void previously held by SOE’s. 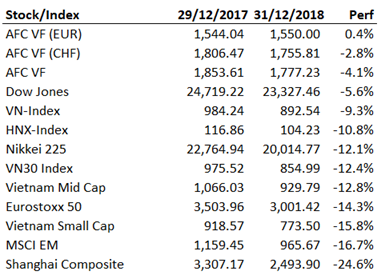 The best performing indexes in the AAFF universe in December were Cambodia (+21%), with a year to date performance of +39.6% and probably the second-best performing stock market in the world behind Ukraine with +80% in USD, Kyrgyzstan (+10.1%) – with +36.7% in USD the third best performing stock market in 2018 globally, and Mongolia (+10%). The poorest performing markets were Pakistan (−9.0%) and Vietnam (−3.7%). The top-performing portfolio stocks this month were an IT company from Mongolia (+35.8%), a Vietnamese insurance company (+34.4%), a Mongolian trading company (+27.6%), an airport operator from Kyrgyzstan (+24.4%), and a cement company from Mongolia (+23%). In December, we added to existing positions in Mongolia, Uzbekistan, and Vietnam and added two new companies from Uzbekistan: a coal mining company and an engineering company. We exited one port operator and one mining company in Cambodia, an engineering company in Vietnam, a mining company in Mongolia, and two companies from Myanmar. We partially sold 4 Mongolian companies and each one company from Bangladesh, Myanmar, and Vietnam. As of 31st December 2018, the portfolio was invested in 110 companies, 1 fund and held 4.7% in cash. The two biggest stock positions were a pharmaceutical company in Bangladesh (6.9%) and a pump manufacturer from Vietnam (5.1%). 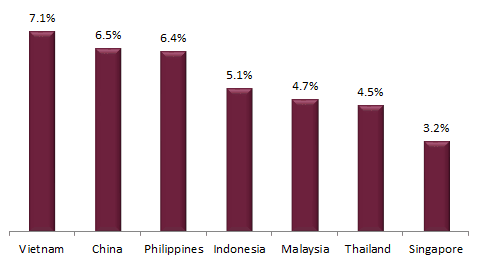 The countries with the largest asset allocation include Vietnam (26.0%), Bangladesh (19.8%), and Mongolia (17.7%). The sectors with the largest allocations of assets are consumer goods (29.8%) and industrials (21.5%). The estimated weighted average trailing portfolio P/E ratio (only companies with profit) was 11.91x, the estimated weighted average P/B ratio was 1.99x, and the estimated portfolio dividend yield was 4.79%. 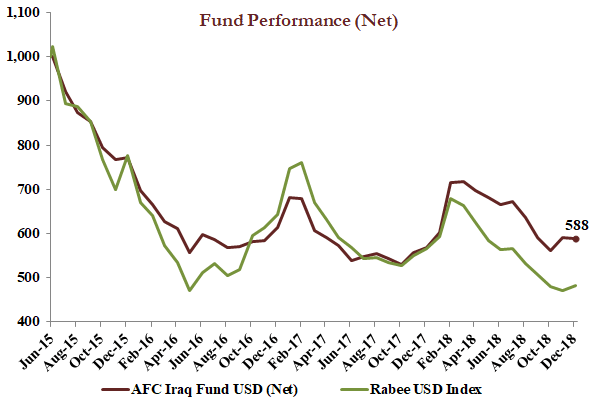 The AFC Iraq Fund Class D shares returned −0.7% in December with a NAV of USD 587.81 which is an under-performance versus its benchmark, the Rabee USD Index (RSISUSD index) which was up +1.9%. Yet this comes on the back of the prior month’s sharp outperformance with a gain of +5.3% vs. the index’s decline of −1.7%. The fund outperformed its benchmark sharply in 2018, up +3.6% vs. the index’s decline of −15.0%. The variance in performance is due to the portfolio’s structure with a broader selection of stocks as compared to the index, with a higher quantity of banking stocks, a less top-heavy concentration, and an overweight position in telecom. December 2018 was probably the worst month in a decade for global equities, however, the month’s sharp declines are eerily similar to those that drove the markets lower in December 2015 with the similarity extending to almost a replay of the start of 2019 to that of 2016. The reasons, now and then, are fears of a slowing world economy with the world’s engine, China, showing signs of a meaningful slowdown. But the drivers of the slowdown this time are increasing evidence of the damage from the US-China trade war, echoing the Iraqi saying that “while reasons are many, death is the same”. However, now and then, the slowdowns were months in the making, but the markets ignored them until late in 2018. The Iraq Stock Exchange (ISX) on the other hand, as measured by the Rabee Securities RSISUSD Index, quietly eked out a modest gain throughout the month to end up +1.9%. This gain came despite sharp declines in the price of oil for the month that took Brent crude prices down about –40% from the October multi-year peak. The ISX’s negative −15.0% return for 2018 marked the fifth annual decline, on the back of declines of −11.8% in 2017, −17.3% in 2016, −22.7% in 2015, and −25.4% in 2014. The ISX further spent most of the last two years trying to break out; only to revisit the major May 2016 lows as each year came to a close. This contrasts sharply with most global equities as the December sharp sell-offs took them down to about −20% off recent multi-year highs. This makes the risk-reward profile more attractive for the ISX versus these markets as portfolio allocations are rebalanced in the light of the changed global environment. Supporting the risk-reward profile for the ISX is the prospect of a recovery in corporate earnings. Iraqi equities should emerge from a multi-year severe economic contraction with telecoms being the first to emerge. Two of the major mobile operators out of three national operators reported Q3/2018 earnings that displayed the markers of recovery in earnings, margins and profits. Of the two, AsiaCell (TASC), listed since 2013, has a reported earnings span of 2012-2018 reflecting the operating environment before, during and after the ISIS conflict. For TASC, the recovery started in late 2017 with the liberation of Mosul and the gradual return of customers lost since the 2014 ISIS invasion of a third of the country. As reported last month, TASC signalled its confidence in its future outlook with a distribution of a 12% dividend on the back of last year’s dividend distribution of 14% – which in absolute terms is about a third higher than last year’s dividend. (See “Telecoms dial up Recovery” for further details on TASC). The recovery for TASC extended to its stock price, which ended 2018 up +47%, following declines of −17% and −11% for the prior two years. TASC was joined by Baghdad Soft Drinks (IBSD), which was up +34% in 2018 on the back of 2017’s increase of +7%. IBSD is unique among the ISX’s listed companies as it continued to churn out healthy earnings growth throughout the downturn. Earnings for IBSD grew +13% in the first nine months of 2018, on the back of growth of +11% in 2017, +25% in 2016, and +37% in 2015 (pre-tax earnings). Looking to 2019, the recovery of the banking sector would hinge on an economic recovery and a return of liquidity to economic activity, which for most of 2018 were held back by political uncertainties surrounding the May parliamentary elections. Political uncertainty before the May 2018 elections was followed by indecisive election results, which in turn resulted in further uncertainties as the different political parties entered lengthy negotiations for the formation of a coalition government. Adding to these uncertainties was the eruption of massive demonstrations in the south demanding reform and investment into basic services. Things became clearer in early October with the promising appointments of a president and a prime minister in a fashion that broke the failed mould of the past. These were followed with the formation of a working government, which while still incomplete, can begin to act on the needed spending for a post-conflict recovery. Paradoxically, while the political uncertainties paralyzed the government process, the government’s revenues soared with the recovery in oil prices, which has put the government on course for a two-year accumulated surplus of up to USD 24.5bn by the end of 2018. The oil market’s decline from the unsustainably high levels of the summer, however, are an unwelcome development but should not alter the country’s improving financial position as long as the government continues with the fiscal discipline brought on by the IMF’s 2016 Stand-By Arrangement (SBA). Moreover, Brent crude prices in a range of USD 50-60/barrel would ensure that the government maintains this fiscal discipline and focus on reinvestments, a focus and discipline that are normally forgotten during periods of high oil revenues. While the October M2 figure is an estimate, it is based on actual M0 figures for the month and the recent M2/M0 multiplier figures. 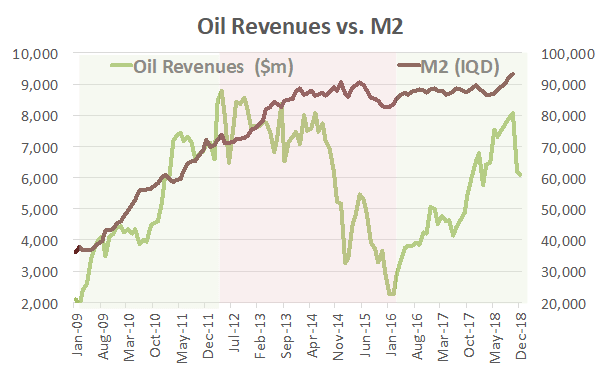 As can be seen above, M2 was moving sideways since oil revenues recovered in January 2016, but it began to accelerate in June - September 2018 – and estimates for October suggest a continuation of this trend. As such, this could mean that liquidity has finally begun to filter down into the economy – which should accelerate as the new government begins to act on its investment programme. 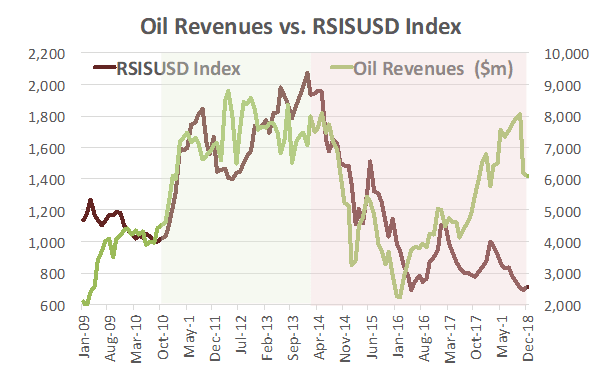 Ultimately, this should filter down into the stock market, which should bring to an end the market’s divergence from its past close relationship with oil revenues – which currently is at the widest it has been for the last few years (see chart below). Recovery in frontier markets is a mirror image of Mark Twain’s phrase on going broke, in that recovery happens gradually and then suddenly. If similar experiences in other frontier markets (declining markets while fundamentals show gradual recovery following a long basing period) hold true, then the trend of the last few months could be followed by a sharp reversal. However, for Iraq significant challenges remain with the huge demands for reconstruction, winning the peace, defeating a likely emerging ISIS insurgency, and controlling violence. In particular, the fragmented politics of the new parliament will continue to be a marker of risk for the government’s future stability, which would in turn pose a risk to economic recovery. As of 31st December 2018, the AFC Iraq Fund was invested in 14 names and held 6.3% in cash. The fund invests in both local and foreign listed companies that have the majority of their business activities in Iraq. The markets with the largest asset allocation were Iraq (96.6%), Norway (2.7%), and the UK (0.7%). The sectors with the largest allocation of assets were financials (46.8%) and communications (20.8%). The estimated trailing median portfolio P/E ratio was 10.97x, the estimated trailing weighted average P/B ratio was 0.81x, and the estimated portfolio dividend yield was 6.28%. 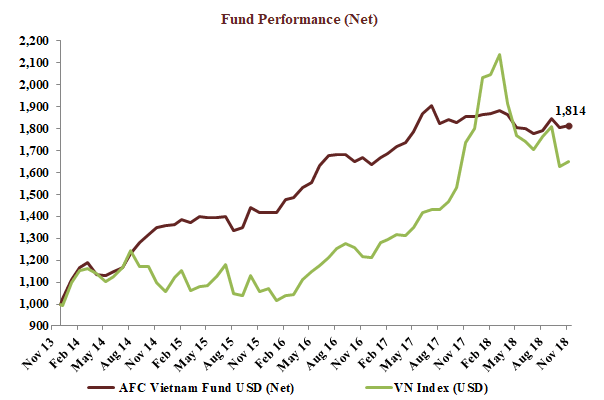 The AFC Vietnam Fund returned −2.0% in December with a NAV of USD 1,776.74, bringing the return since inception to +77.7%. This represents an annualised return of +12.1% p.a. The Ho Chi Minh City VN Index in USD lost −3.4%, while the Hanoi VH Index lost −0.3% (in USD terms). The broad diversification of the fund’s portfolio resulted in a low annualized volatility of 8.67%, a high Sharpe ratio of 1.31, and a low correlation of the fund versus the MSCI World Index USD of 0.30, all based on monthly observations. 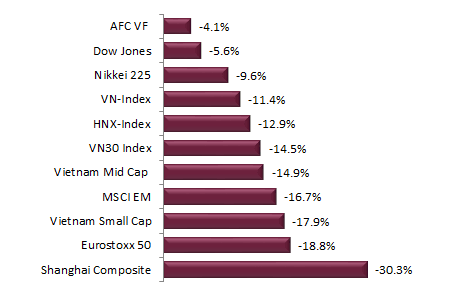 The month of December can be seen as the climax of an already ugly year in all markets, including Vietnam. Deflating prices in overvalued stocks in the world’s leading market, the USA, led to declines in Vietnam as well, although to a much lesser degree and the Vietnamese Dong was even able to gain against the USD by 0.4%. Nevertheless, the index in HCMC lost -3.7% and ended the year with a loss of -9.3% in local currency (-11.4% in USD). The index in Hanoi didn’t fare much better, experiencing a loss for the month of −0.6% and ending the year down −10.8% in local currency (-12.9% in USD). Along with our strategy, we always note how unimportant short-term swings in a market like Vietnam are and how low our volatility is (our invested capital is always between 95% - 98%), and despite having our first yearly loss after 4 continuous years of gains, those losses are rather mild with the expected NAV down just −4.0% in USD terms after gaining 80% in previous years. The loss for 2018 in local currency at -1.8% was very small and depending on the investor’s home currency, the fund’s performance was even break even or positive in the respective currency of € or GBP. After just recently celebrating our fund’s 5th anniversary on 23rd December 2018, we can look back at an annualized USD performance of 11.4% with a very low annualized volatility of only 8.7%. Based on the highly attractive valuation of our portfolio and the success story of Vietnam which is continuously improving, we are looking forward to a prosperous future. In December we finally saw something really “remarkable” as the financial media was looking, as always, for attention. Their headlines included “worst Christmas Eve day ever”, “worst December since 1931” and “all major indices and markets now in bear market territory”. It should be noted that these headlines are mostly from the same sources that were sending out super bullish messages just a few months ago, in line with most strategists’ bias for further gains. We did not like to see the US equity bubble expand over the past two years and we are certainly not happy with the declines hitting markets around the globe in Q4. Though, to keep things in perspective, most markets are now back to the levels seen two years ago and not at a level people would need to expect a world economic crisis like in 2008/2009 where many economic indicators were much more alarming than today. We see the overvaluation in certain sectors and markets deflating rapidly as there is no more “money for free” from most central banks; people just have not experienced any major losses over the past nine years, which was exceptional and not sustainable. It is not something we care too much about, but after we experienced similar losses in history, including the global financial crisis of 2008/2009, we saw either massive mid-term rebounds or long-term bottoms. Nevertheless, the dimension of the US stock market decline in just one single week (17th − 21st Dec.) was shocking with a loss of around USD 2,000 bln – this is roughly equivalent to 11x the total market cap of Vietnam’s stock market, or 8x Vietnam’s GDP! Bear markets are defined as corrections of at least 20% from the top, which does not mean anything in reality. Depending on the absolute valuation of the market, earnings, and economic outlook, a correction of 20% can lead to undervaluation and long term buy signals, or just prove to be the start of a longer-term normalization or even undervaluation of stock valuations. As for now, the global markets look to us like they are entering a necessary period of consolidation which will bring market valuations again in line with their long-term earnings trends. 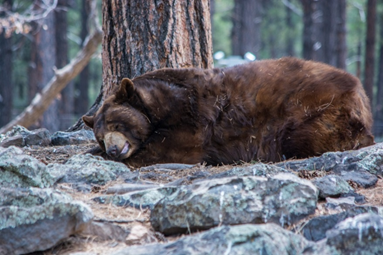 We therefore think that the “bear” will most likely stay asleep, which should be the case for most markets next year, especially if the global trade situation does not get worse and our world leaders realize that they have nothing to gain from their protective trade measures. That does not mean that volatility will end anytime soon and that all markets will rebound in a synchronized fashion, but many markets are well positioned, especially frontier and emerging markets, which have not rallied in recent years along with most developed markets, and on the other hand didn’t decline as much recently along with the bigger and often wrongly called “safe” markets. We are convinced that it makes a lot of sense to ignore short-term swings, panics and euphoria, and instead observe long-term developments. 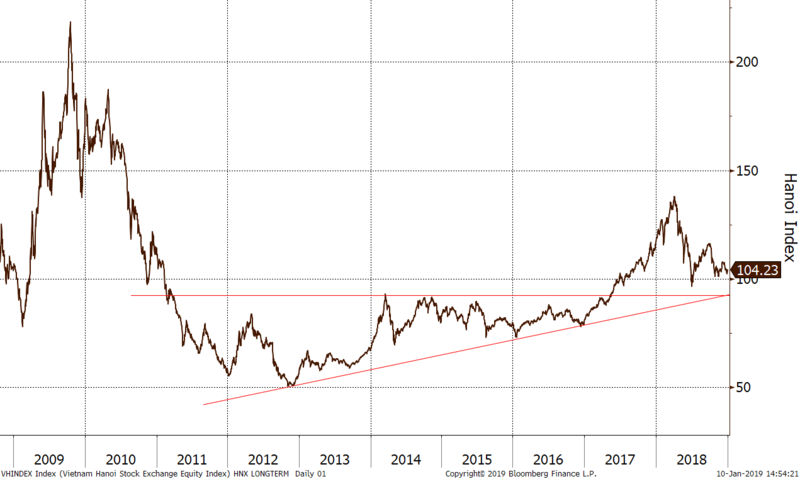 In the Hanoi Index chart below we marked the prices at year end. Just let us reflect a little bit and think which of all these events that we didn’t know of at the beginning of the year and which then suddenly out of the blue happened during the year and materially impacted the market. Afterwards, will someone still want to predict what to expect in 2019? We can only measure valuations, growth perspectives and therefore risks for the long-term. Everything else is pure speculation by all of the market gurus and the hundreds, or thousands, of broadcasting and internet portal. Everybody likes to buy at a discount (daily needs, cars, houses), but not stocks. The more expensive a stock, the more convinced investors are, but the cheaper a stock gets, the more scared everybody is to buy. If somebody purchases a car and then gets a 10% discount on the listing price the buyer will be happy despite the fact that this car will most likely depreciate in value over time - but (most likely) the owner of that car also has a real need or pleasure for this purchase and hence does not consider it as a real loss. With stocks it is different: the sole reason for a purchase is to sell them at a higher price in the future, and as soon as doubts of potential future gains arise, the tendency to sell, sometimes in panic, increases. During these turbulent times we have tried to find out (in a rudimentary and simple manner) how far the current correction has already gone in terms of valuation adjustments. Looking at the indices for Vietnam and the USA, both trailing valuations came back to levels which look attractive again, or at least not expensive. The P/E’s of the Vietnamese indices currently stand at 15.8x for the Ho Chi Minh City Index and 8.9x for the Hanoi Index! Comparatively, the P/E for the Dow Jones Industrial Average Index stands at around 18x. But from a bottom up angle, it is still hard to find a lot of real value and hence attractively valued stocks in the US markets. While popular technology stocks are still trading at 30-80x trailing earnings, brand name consumer stocks are mostly trading between 20x and 40x. Mainly financial stocks and a few other select names bring the average down to 18x. In Vietnam there are still a few blue chips trading at elevated valuations, but most companies are now back to very reasonable valuations, even FPT, the leading technology stock, which is now trading at only around 10x earnings. Many stocks in the small/mid-cap sector can even be found at only 4-10x earnings, a level last seen 4-5 years ago, around the time we started the fund and showed superior gains thereafter. Looking beyond current stock movements, we see Vietnam continuously getting more and more integrated into the global economy. Trade pacts with the EU and other countries are only accelerating a trend which has been in place for some years already. High FDI inflows continued in 2018 and make Vietnam an important trade partner for the world. China’s economic surge began in the 90’s, with Vietnam now playing catch up – while from a low base and at a smaller scale than China, despite having a population racing towards 100 mln. 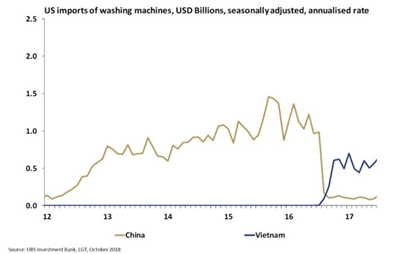 Just one example of this trend is the manufacturing and export of washing machines, where Vietnam took around 50% of the market share from China – and that was before the start of Trump’s trade war! Most of the economies of Southeast Asia with a close relation to China, such as Singapore and Malaysia, had a difficult year in terms of economic growth, with the sole exception being Vietnam. This is mainly due to an acceleration of FDI inflows into the manufacturing sector, as many large manufacturers in China look for alternative jurisdiction to avoid the impact of the trade war. 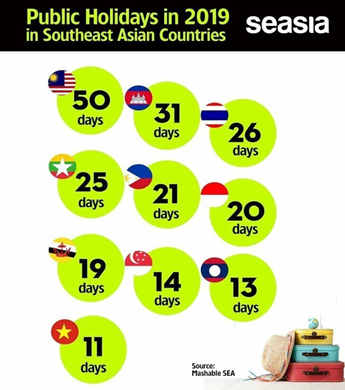 With only 11 public holidays, Vietnam seems to be one of the hardest working countries in Southeast Asia and they certainly make sure that their foreign trading partners can reach them easier compared to any other country in Southeast Asia. At the end of December 2018, the fund’s largest positions were: Agriculture Bank Insurance JSC (3.8%) – an insurance company, Vietnam Container Shipping JSC (3.0%) – a container port management company, Sametel Corporation (3.0%) – a manufacturer of electrical and telecom equipment, Global Electrical Technology Corporation (2.6%) – an electrical equipment company, and Lien Viet Post Joint Stock Commercial Bank (2.5%) – a bank. The portfolio was invested in 67 names and held 4.8% in cash. The sectors with the largest allocation of assets were industrials (34.2%) and consumer goods (30.0%). The fund’s estimated weighted average trailing P/E ratio was 9.13x, the estimated weighted average P/B ratio was 1.50x and the estimated portfolio dividend yield was 7.93%. I hope you have enjoyed reading this newsletter. If you would like any further information, please get in touch with me or my colleagues. This Newsletter is not intended as an offer or solicitation with respect to the purchase or sale of any security. No such offer or solicitation will be made prior to the delivery of the Offering Documents. Before making an investment decision, potential investors should review the Offering Documents and inform themselves as to the legal requirements and tax consequences within the countries of their citizenship, residence, domicile and place of business with respect to the acquisition, holding or disposal of shares, and any foreign exchange restrictions that may be relevant thereto. This newsletter is not intended for distribution to or use by any person or entity in any jurisdiction or country where such distribution or use would be contrary to local law and regulation, and is intended solely for the use of the person to whom it is intended. The information and opinions contained in this Newsletter have been compiled from or arrived at in good faith from sources deemed reliable. Opinions expressed are current as of the date appearing in this Newsletter only. Neither Asia Frontier Capital Ltd (AFCL), nor any of its subsidiaries or affiliates will make any representation or warranty to the accuracy or completeness of the information contained herein. Certain information contained herein constitutes “forward-looking statements”, which can be identified by the use of forward-looking terminology such as “may”, “will”, “should”, “expect”, “anticipate”, “project”, “estimate”, “intend”, or “believe” or the negatives thereof or other variations thereon or comparable terminology. Due to various risks and uncertainties, actual events or results or the actual performance of Funds managed by AFCL or its subsidiaries and affiliates may differ materially from those reflected or contemplated in such forward-looking statements. Past performance is not necessarily indicative of future results. © Asia Frontier Capital Ltd. All rights reserved. The representative of the funds in Switzerland is Hugo Fund Services SA, 6 Cours de Rive, 1204 Geneva. The distribution of Shares in Switzerland must exclusively be made to qualified investors. The place of performance and jurisdiction for Shares in the Fund distributed in Switzerland are at the registered office of the Representative. AFC Asia Frontier Fund is registered for sale to qualified /professional investors in Japan, Singapore, Switzerland, the United Kingdom, and the United States. AFC Iraq Fund in Singapore, Switzerland, the United Kingdom, and the United States. AFC Vietnam Fund in Japan, Singapore, Switzerland, and the United Kingdom. By accessing information contained herein, users are deemed to be representing and warranting that they are either a Hong Kong Professional Investor or are observing the applicable laws and regulations of their relevant jurisdictions. You can update your preferences or unsubscribe. © 2019 - Asia Frontier Capital Ltd.